2018 Booth space is full. The Cowan Christmas Market will be held in the Monterey Station on November 30 & December 1, 2018. The booth size is 10’ x 10’. Booth fees are $50 for one booth and $90 for two booths or $130 for three booths. The Monterey Station can accommodate 60 booths. Each booth will have electricity; you are encouraged to decorate your booth. Each vendor must furnish their own tables, display equipment and chairs. Tent frames are permissible; however the canopy shall not be used. Booths 1-7 will be reserved as a food court. For consultants of catalog businesses, such as Mary Kay, Pampered Chef, Avon, etc, only the first receipt of application and fee will be accepted for these products. No refunds for cancellation after October 1, 2018. The vendor committee encourages each vendor to sponsor a door prize. Please supply a business card with the door prize written on the back side. Each winner will be directed to your booth to claim the prize. Set up times at Monterey Station will be Thursday November 29 from 12 pm to 6:00 pm, and Friday, November 30 starting at 10:00 am. Each booth will be marked with the vendor name. The Cowan Christmas Market hours will be Friday November 30 from 3:30 pm to 9:00 pm. Saturday hours will be 10:00 am to 4:00 pm. Vendors are required to have their booths open both days. The Cowan Christmas Parade and Market Committee reserve the right to decline or prohibit any vendor merchandise that, in the opinion of the Committee, is not professional or appropriate for the Cowan Christmas Market. 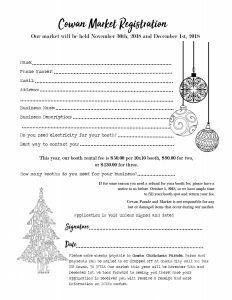 The committee recommends each vendor to “like” the Cowan Christmas Parade and Market facebook page at www.facebook.com/cowanchristmas. If you have any questions please submit your question as a message on the facebook page.